Literature Related to Artist and Alienation in "Ethan Brand"
In the opening excerpt, Ethan Brand introduces himself to Bartram, the lime-kiln burner who has taken his old job. In this excerpt, we learn Ethan Brand's idea of the Unpardonable Sin. In this excerpt, we witness Ethan Brand's alienation and his denial of his brotherhood. In this excerpt, the cur of the new age performs, as do Brand and the villagers. Brand, an intellect in an industrial age, schooled as any performative male prepared for the marketplace centers of power, meditates before the kiln one last time, and as Hawthorne suggests in this excerpt, he receives insight into his life. In this excerpt, Brand understands that he has become a "fiend" and decides to transform his marble heart into lime. 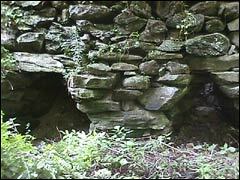 In this excerpt, we see Joe's relationship with his father as they discover the remains of Ethan Brand in the lime-kiln. Link to full text of "Ethan Brand"